Enjoyed as a light main dish, or as a side – the fresh flavour of cool yoghurt, mint and lemon contrast beautifully with the earthy taste of delicious roasted beetroot and crunchy hazelnuts. This versatile and vibrant root vegetable lends itself to a whole host of accompaniments – it even works wonders in a chocolate cake! Pre-heat the oven to 200ºC. Place 3 of the beetroots in a roasting pan, add the garlic cloves, 200ml of water and the herbs (excluding the mint leaves). Drizzle with Filippo Berio Classico Olive Oil. Cover with foil and bake for 1 hour. When cooked, remove and allow to cool. Remove one of the soft garlic cloves, push out the flesh, chop and set aside. Empty the yoghurt into a bowl and add the chopped garlic clove, half of the lemon juice, and season to taste. Take the remaining beetroot and slice thinly into disc shapes. Set aside in cold water to keep crisp. Cut the roasted beetroot into chunks and place on a platter. In a large bowl, add the rocket, chicory, beetroot discs, chopped hazelnuts, mint leaves, Filippo Berio Extra Virgin Olive Oil and the rest of the lemon juice. Stir to combine. 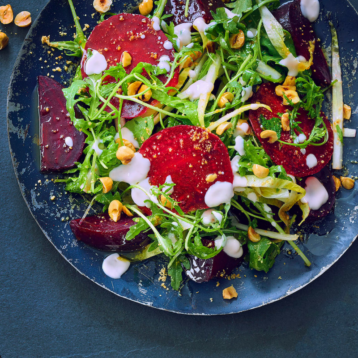 Place on to the beetroot chunks, drizzle over the yoghurt dressing and scatter with the lightly crushed hazelnuts. Finish with a final drizzle of Filippo Berio Extra Virgin Olive Oil.